Note: Someone from the American Museum of Natural History asked me to post the museum's fall migration bird walk schedule here and I'm happy to comply. 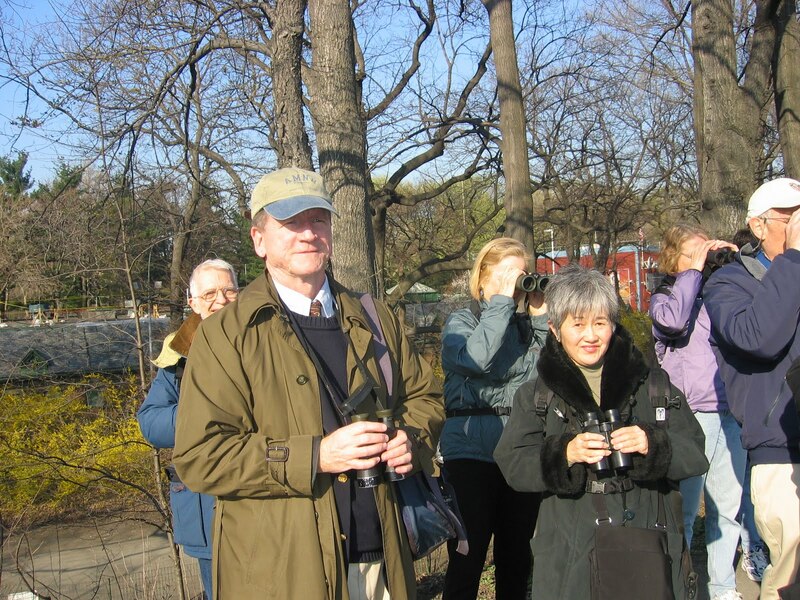 I've been going on the AMNH bird walks for many years. They're great! 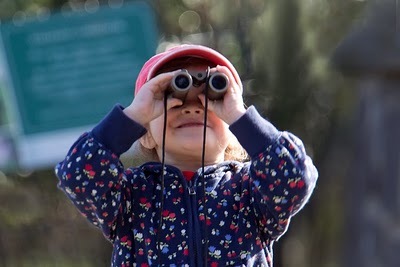 Observe more than 50 different species of birds—including resident and migrant birds, water birds, song birds, and birds of prey— during this eight-week bird-watching adventure in Central Park. Join naturalists Stephen C. Quinn (Tuesdays and Fridays), Joseph DiCostanzo (Wednesdays and Thursdays, 7 am), and Harold Feinberg (Thursdays, 9 am) on tours through the park, one of the premier places locally to watch birds during spring and fall migrations. Participants will learn how to use field marks, habitat, behavior, and song as aids in identification. Interested birders, from beginners to the advanced, are invited. Walks start across from the Museum on the northeast corner of Central Park West and 77th Street. I thought you and some of your readers might be interested in a Liliana update as she has come a long way since you first posted a photo of Liliana when she was 6 weeks old. 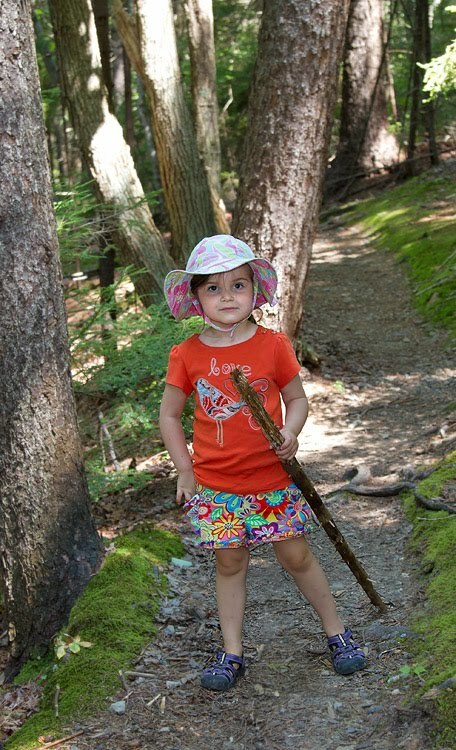 Liliana is turning into quite an all around naturalist. 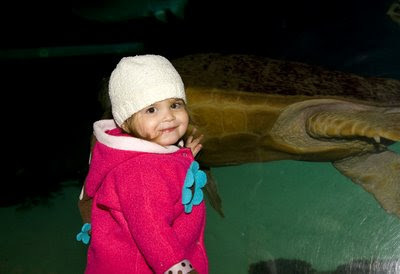 We spent 2 ½ weeks in Maine in August and had a great time.. .. we searched for beavers, frogs [saw 4 different species,] explored tidal pools (Liliana’s favorite was the piece of a jellyfish we found). Of course we looked for birds and we spotted a Barred Owl, Bald Eagle and Liliana’s favorite, American Goldfinch. 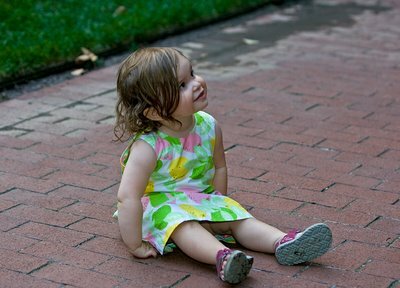 She now knows the flight call --- not a hard one to teach a nearly 4.5 yr old: potato chip. 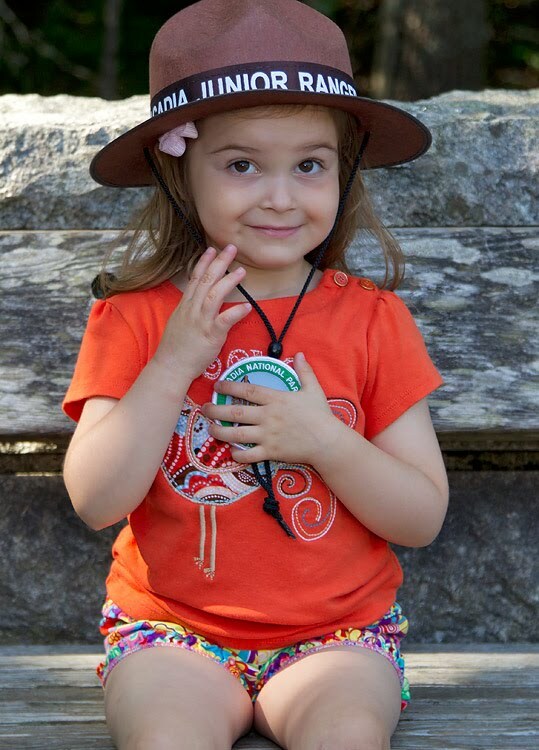 All her learning culminated in Liliana earning her Junior Ranger Badge . We had a great time as a family , learned a lot and Liliana can thank NYC and Central Park as the foundation for her ever expanding view of the world and more importantly her appreciation of the natural world. 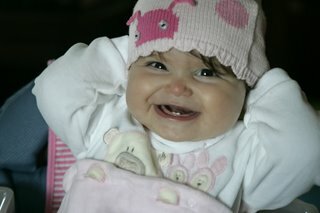 Below, a quick summary of some of the Liliana photos [taken by her Daddy, of course] that have appeared on this site. Rare Sparrow-might still be there!!! And 13 warbler species -- nothing to sneeze at either. A Grasshopper Sparrow appeared at the Great Hill in the park's northwest quadrant - first seen on the upper south slope (a bit below a cyclone-fenced wood-chip filled area) and then moving down to a somewhat more brushy area in the lower slope about 20 yards above the north side of the Pool, the closest park entrance being at West 103 Street. Additionally and almost a bit more surprising, a Lincoln's Sparrow was in the same area a bit higher on the hill in denser vegetation. A 'baker's dozen' (13) warbler species in the first 150 minutes of the morning with a Worm-eating Warbler at the Loch (in the central area within), also located in the north end of the park being the highlight amongst the warblers, which included a modest fresh arrival including obviously more Magnolia Warblers. The general migrant activity seemed patchy with birds in smallish flocks for the most part, an increasingly common sight even on bigger days of migratory passerine stopover, as compared with a decade or two in the past. More reports later or at night as warranted. This morning's Grasshopper was seen at about 7:30 a.m. & again at about 8:45 and again the later sighting was farther down-slope nearer the Pool. I briefly looked 'round Summit Rock very early on and saw relatively little at that early hour - but would think Ramble area observations could also be good this day. (Summit Rock is near W. 83-84 Streets). Despite a lot of (needed) rain and low clouds, wind, & nicely cooler temperature through most of the day, there were breaks in the weather and a good number of birds about in some areas of the park that I visited today. My highlight was a good look at a brightly-plumaged PHILADELPHIA Vireo in the maintenance meadow area of the Ramble, mid-day & also later. At least a dozen warbler species were around even in such less-than-ideal viewing conditions and among them was my first sighting of the fall season of a Blackpoll Warbler, which along with the several Magnolia Warblers having been found in the past few days & a number of other signals, a good sign that a big move could be on for land bird migration, if not all migrants in general, with the weather changes that are in store. In the Ramble, the areas that have been a bit quiet so far this month had a bit of activity, and there again was a fair amount of activity in trees near the reservoir, especially in the area next to the bridle path at the NW side of the reservoir, as well as in some places closer to the west side of the park. A high number of Spotted Sandpipers, perhaps not quite an all-time high number but at least 20 in the park today, along with a couple of Solitary Sandpipers are further indications of movement. Other species seen included a few Veery, a Wood Thrush, a Rose-breasted Grosbeak or two, and the warblers again including a number of Canada and also one Wilson's Warbler - with these more boreal-breeding species, there's likely a lot more to come thru on the very next cool front or change to any favorable weather overnight. Indeed even this Mon. night there are some signs of modest migration on the coast and perhaps more to the "inland". 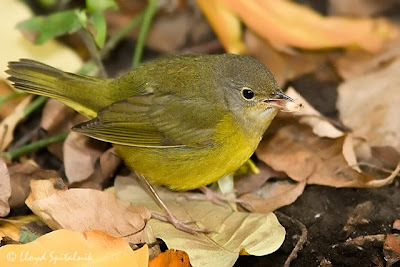 A Mourning Warbler was studied at the "upper lobe" area of the lake shore in Central Park at the western edge of the Ramble area. The observer a very keen birder who once was more regular in Central, now a loyal Brooklyn-ite, the date was Friday, 20 August. On Saturday, 21 August, I birded the park from the north end to Ramble areas in company with Brenda Inskeep and for most of the morning also with Tom Perlman (at the north end), also a bit in the Ramble with others & also one other birder also checking the trees along the bridle path near the NW corner of the reservoir, which was a mid-day mini-hot spot. At least a dozen warbler species were found by us and the busiest locations seemed to be along the Loch, and in the Ramble along the Gill, with migrants more scattered elsewhere. It didn't feel to me like a day of mass movement but the report filed by Jack Meyer, with Pat Craig, Barrie Raik, & Ellen Rockmuller for the north end and ~ 20 Eastern Kingbirds in a flock at one time suggests there was migration in progress. For variety, it was warblers that held sway with at least a dozen warbler species being found of which I'm aware. By far the most numerous of these and seen in many areas were American Redstart, with 30+ seen in all areas & a minimum of 15+ in the north end only. 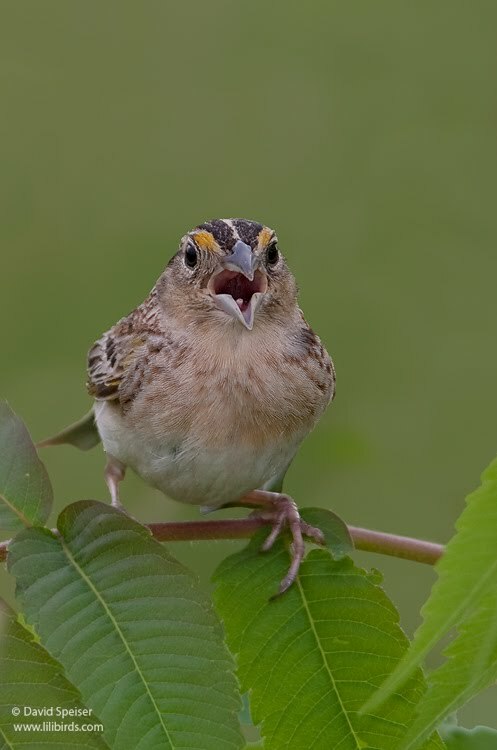 After them, Yellow (5+) & Black-and-white (6+) Warbler, Northern Waterthrush (6+) & Common Yellowthroat (5+) were most common, with others including Ovenbird (3), Canada (3), Blue-winged (2), Northern Parula (2), Tennessee (1), Black-throated Blue (adult male, Loch), and Prairie Warbler[s]. The Mourning Warbler seen on Friday was looked for by us on Saturday without success - it would have a lot of thick vegetation to hide in where seen but the sighting from Friday was said to be quite clear. Additional sightings for Saturday included Chimney Swifts in modest numbers, several Ruby-throated Hummigbirds, investigating red Cardinal Flower blooms in some areas & the Orange Jewelweed patches in a few others, along with Eastern Phoebe, Great Crested Flycatcher, Eastern Wood-Pewee, at least several Empidonax-genus flycatchers, the aforementioned E. Kingbirds plus a few more of them, a smattering of Vireos, Warbling & Red-eyed noted by us, a Veery or two along with Wood & an unid. Thrush that may have been a Swainson's or another of our eastern-breding Catharus, Gray Catbirds in the multitudinous, Rose-breasted Grosbeak, and a few interesting mentions of other passerines which for now, remain undisclosed - as to specific identities given, by their observers. Sunday, not quite an all day rain-out in Manhattan, featured a similar variety of birds as Saturday but with the interesting addition of some shorebird activity: Greater Yellowlegs (quite uncommon in the park) at the Lake edge near Balcony Bridge, and 3 Solitary plus 10 or more Spotted Sandpipers in many locations. 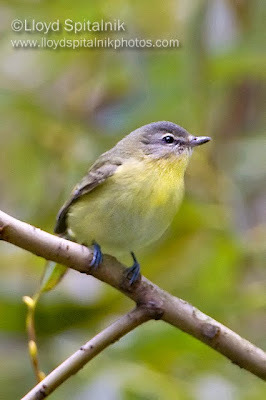 I found 8 warbler species, again with American Redstart predominant. There were a few more Veery seen this wet day than Saturday and also on both days were no shortage of Baltimore Orioles, including fair numbers of adult males.